It is safe to say that our entrance into the historic city of Venice was one of the most unique experiences of our lives. A magical place where water outweighs land, you immediately surrender yourself to the sounds, smells and sights of Italy at its most opulent and eccentric. We found ourselves thrown in at the deep end… whisked away in an elegant water taxi, dodging gondolas and tourist ferries, gasping with pure joy at our breathtaking surroundings. Italians own these waters, and we are at their mercy. Reveling in the excitement and romance of this unimaginable city, we set off south along the Grand Canal, making our way to our Venetian home for the evening, The Gritti Palace. Majestic, magnificent, and classically Venetian, The Gritti Palace radiates pure magic. It is a place for lovers: lovers of architecture, lovers of antiques, lovers of sublime views, and lovers of unparalleled service. A well-groomed bellboy greets us with charm and charisma, and kindly guides us from the water to the front door. Capturing a brief glance at the grand facade and striking views, we step inside and are instantly transported to another time; with a warm smile and a kind demeanor, the hostess escorts us to our very own private palace, the Peggy Guggenheim suite. One of the exclusive heritage rooms, the Guggenheim Suite honours the legendary collector, once a frequent visitor of the hotel. The design is opulent and elegant, an abundance of luxurious detail and state-of-the-art comforts. Floor to ceiling marble, exquisite antique furnishings, timeless artwork, an incredibly cosy Signature Luxury Collection bed and a balcony overlooking the Santa Maria della Salute. Nothing in this world can compare. 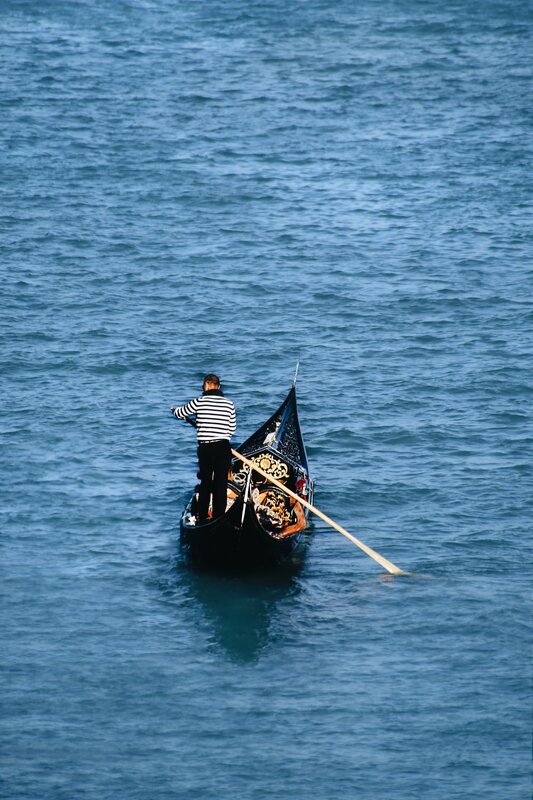 As the sun started to set, the gondoliers below began to serenade the wandering world, bellowing ‘Volare’ to the delight of cheerful tourists, snapping away with their cameras. We stood out on our balcony, sipping rose and reveling in the glorious views of the Grand Canal; taking in each and every moment. One can only imagine how different, yet similar it must have felt when Ernest Hemingway was nestled up in the exact same spot, pondering life and soaking in Venezia’s pure charm. As the day drew to a close and darkness fell, flickering lights danced across the water, creating a new type of magic. We were fast learning that Venice is a city that never ceases to amaze; each moment, alleyway, sight and sound created to delight the souls of passing lovers. The ambience was utterly romantic, deep in conversation we reflected on the day’s events before being swiftly shown to our canal-side dining table; it was time for the main event. At Gritti’s restaurant, Club del Doge, the atmosphere is electric and the views out of this world; the terrace glows with the warm flicker of candlelight as guests are serenaded to the gentle hum of traditional Italian melodies under the stars. Executive Chef Daniele Turco personally introduced us to four wonderful courses of authentic Venetian gourmet cuisine, paired with a bottle of local red wine chosen by the sommelier. We started with an assortment of Venetian Cicchetti: spider crab, lagoon prawns and scallop gratin complimented with white peach salad and biancoperla polenta. Our first and second courses, pacchero pasta with mussels lobster and chilli and a ‘Hemingway’ style risotto with fresh langoustines were beautifully presented and cooked to perfection. We finished our meal with a traditional Tiramisu — our favourite dessert and probably our fourth of the trip... when in ‘Venice’.